Knee deep in manure and loving it! 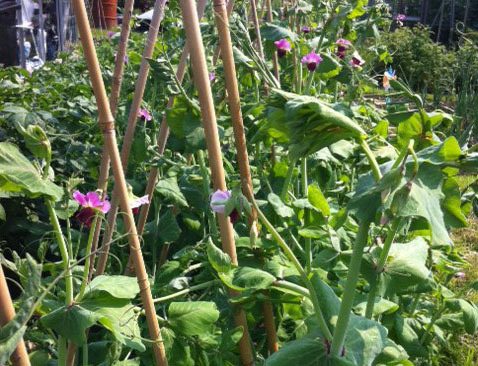 Last year I took on my first allotment plot. The hubby and I have previously had a veggie patch in the garden, but with a new house and a smaller garden we decided to explore the allotment options in our area. There was plenty of choice and we were keen to give it a go. The half plot we chose was fantastic and we were lucky to inherit 5 apple trees, a pear tree, raspberry and blackcurrant bushes along with established strawberry and rhubarb beds. On the downside, however, the plot had become quite overgrown and required a fair bit of taming before we could begin planting. In our excitement at securing our first plot we also agreed to a delivery of manure! What we didn’t quite realise was just how much we had signed up for and how difficult it would be transferring it from the path and onto the beds. Now I’m not a tall person (‘perfectly sized’ as I like to tell my colleagues), but the pile that eventually arrived came up to my shoulder! It took the two of us a good 5 hours to shift it off the path and left us both aching in places we didn’t know we could! The results, however, made all the aches and pains worth it. As well as enjoying the fruits of our labour for the past year (eating our final potato only last month), we’ve also taught ourselves some new skills. Since taking on this challenge we’ve made our first batch of cider, numerous pots of rhubarb and ginger jam, rhubarb sorbet and strawberry & raspberry coulis. Some of my favourite moments have been visiting the allotment in an evening to water the plants. It’s such a peaceful and positive place – a great environment to unwind and mingle with the birds, frogs and the occasional human!